The Following is a guest post from Bryan. He writes about his family's Flexibly Independent lifestyle and financial journey on IncomeSurfer.com. He also recently created AllTravelJourneys.com as a place where fellow traveler could swap tips and trip ideas. It's no secret that since the 2008/2009 financial crisis, the S&P 500 has trounced many foreign market indices. This relative outperfomance has led some to question if US investors really need to own companies that are based outside the United States. The topic comes up whenever the US stock markets outpeform international markets for few years. (Remember the late 1990's!) Some very high profile investors, such as John Bogle, have repeatedly said that US based investors shouldn't bother to invest in companies outside the United States. I have a great deal of respect for Mr. Bogle, but that is one bit of advice I am not following. I have always had a small percentage of my portfolio invested internationally, but in recent years I have been ramping up that percentage as investors have taken a negative view on stocks in many international markets. There are several potential advantages to international investing, such as currency exposure and different valuations, but for me the biggest really comes down to owning less correlated assets. While we live in a globally connected world, and equities often move in unison for short periods of time, they rarely move in perfect unison for long periods of time. This is important, because while while I've read research (from both Ken Fisher and John Bogle) that most international markets have historically returned about the same amount over very long periods (say 50 years) of time......most retail investors aren't able to set their portfolio and leave it alone for 50 years. Along the way they may want to take advantage of other opportunities and buy an apartment house, commercial real estate or a farm. Maybe there is a family emergency and they need to help care for an aging parent. More likely than not, the trouble would come along in retirement when the hypothetical investor begins to sell some percentage of the portfolio each year in order to provide extra money to live on. If you're a straight dividend investor, maybe you'll never sell, but most do at some point. Owning assets that have a reduced correlation can provide a huge benefit in any of these instances. You would have the ability to sell a group of investments that have been doing very well recently, and not be forced to sell out of another group of investments that aren't being valued quite as highly by the market at the current time. The idea of reduced correlation gives you more tools in your investor toolbox, and that's a great thing! This idea obviously extends to many other investment groups (such as US bonds, international bonds, precious metals, real estate, etc), but it works with international and US equities as well. Take a look at the graphic below, courtesy of Fidelity. I completely agree that the last 40 years is only a snapshot of the investing history, but I think this graphic illustrates that these markets are not in perfect sync. Back before Mrs IS and I became Flexibly Independent, we always participated in the retirement plans offered by our employers. We would invest in 3 or 4 funds within the administrator's offerings. We would always keep an eye on the portfolio allocation and rebalance those fund holdings whenever they strayed more than 3 or 4 percent from our desired allocations. There was typically no charge (depending on the plan administrator) to rebalance, and I found we would usually do so once (or sometimes twice) per year. This had the effect of forcing us to take some of the capital gains and redeploy that capital into assets that had been performing less well. I like that sort of systematic approach and recognize that it wouldn't be an option if all of our assets were of one particular kind or type. 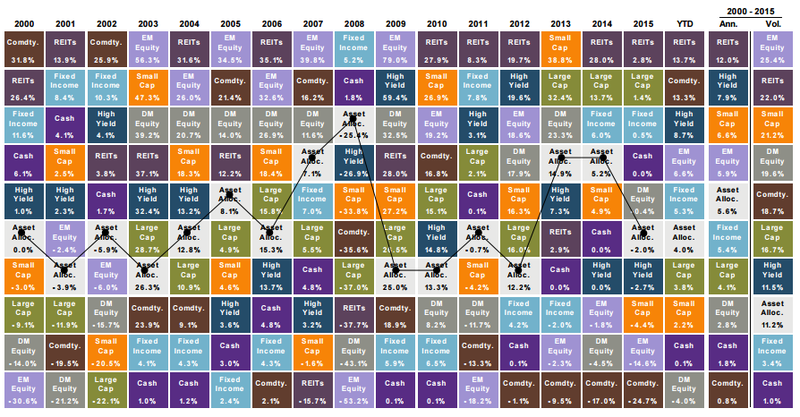 As the table at the top (courtesy of JP Morgan and Roadmap2Retire.com) illustrates, different asset classes tend to outperform for a while.....and then underperform for a while......and I think that's a great thing. No matter how highly we rate our individual investing prowess, none of us knows what will happen a month or a year from now. What we do know is that some assets or sectors will outperform and others will underperform. Circling around to US based multinationals, they have done very well for a long time now. They also have significant international revenue/sales exposure, as discussed above. About 33% of revenues come from foreign sales for the average S&P 500 company, but among the largest of the multinationals (think Coca-Cola, Dow Chemical, IBM, Apple, Pfizer, General Electric, etc) you'll see international revenue figures around 60%. That's right, many of these companies generate more revenue outside the United States than they do within it. That the stock prices of these stocks is fairly correlated to the S&P 500, and more particularly the respective sectors within it, mean that many of these companies tend to move more or less in unison. That has been a great thing for the last seven years, but I've recently been taking profits on companies that I see as overvalued. I have been holding cash and redeploying a some of that capital into areas that I see as undervalued (or at least less overvalued). Over the past two years that has meant emerging markets, which I invest in by purchasing shares in Vanguards FTSE Emerging Markets ETF (VWO). Over the last several years emerging markets as a whole have underperfomed the S&P 500 by a huge margin. As a result of buying at opportune times, I have nearly my desired position in this ETF and the capital I have invested is performing very well. This portfolio holding is well positioned for future capital appreciation. Around the time of the Brexit silliness, I started building a position in Vanguard's FTSE Europe ETF (VGK). 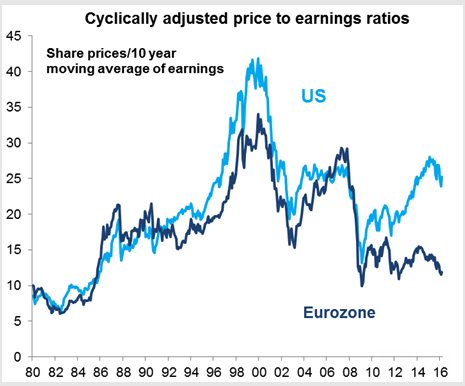 I outlined my reasoning and rationale in THIS ARTICLE, but suffice it to say that the valuation of European equities caught my attention. The graphic below (courtesy of http://awealthofcommonsense.com) uses the 10 year rolling price to earnings ratio to illustrate the case pretty well. While Europe faces many headwinds, this feels like a reasonable level to start building my exposure to European companies. I intend to buy more as the share price falls, and will enjoy a decent dividend payout while I wait for European equities to be more highly valued by investors. In time, it could bear out that the US companies I am calling overvalued (consumer staples, utilities, telecoms) will outperform the European equities I am buying.....but I think it unlikely. No, international diversification is a good thing for my portfolio. Do you invest internationally? Why or why not? Disclosure: Long VGK and VWO. This article is for informational purposes only and should not be considered a recommendation for anyone to buy, sell, or hold any securities. I am not a financial professional. Information on the above funds is available at Vanguard.com. Thanks for reaching out for a guest post JC. I hope life is returning to normal around your house buddy. I'm sure the little one is adorable! Great charts, Bryan. I agree with your take that having investment exposure outside the US can be a great strategy. Staying invested just in US becuase you are familiar with the name means you are so exposed to local problems. Not to mention the issues that come from the currency markets -- which we are seeing these days. Thanks for the kind words R2R, and for directing my attention to the chart at the top of this post. Geographic and currency diversification are two types of diversification I am interested in. This world is getting a little wacky, which should be good news for observant investors. Whats your thought on Most US firms already have international presence and get what can be optimally extracted from local market without much risk (agreed there are few local specific nitch, but increases risk as well). If I remember right Boggle says no international exposure needed for typical investor. Also, I had been in emerging market for almost 10 years and just diluted few years back and added to US index. From my observation, US provides the best infrastructure for business to strive and grow. Returns on emerging as well as international wasn't that well (over 10yrs) compared to US. I see the same with many allocation on companies as well. Moving out of emrging market as cost increases, but this inturn creates market (with increase wage and quality of life), again for US products. I could be wrong. Agree there is inverse correlation and currecy hedge, but lately the macro's have changed, that most often if US goes into recession, other economy follows. Thanks for your comment/question Richard. I agree that the international revenue exposure from many large US based companies is significant, but studies have shown that the stock price of those companies is much more correlated to the equity market where the company is based.....than where it receives it's revenue. It's an odd phenomenon. I am sorry to hear about your experience with emerging markets. I know it's been a tough run. These things go in cycles however, so we may be entering a period of outperformance. The US is one of the most stable and innovative business environments, but for my money it's important to have exposure to other markets. The US isn't likely to lead global finance forever. I currently only have direct exposure to emerging markets through my 401k plan. I have often thought about buying some in my other accounts but I just feel like I don't have the knowledge or experience to open myself up to that much exposure at this point. Although if I did decide to try, it would definitely be through some low expense ETF. With that being said I think that you make some very reasonable points here. It makes a lot of sense for some investors..... just not for me right now. Thanks for sharing!